I’ll eat brussels sprouts anywhere, anytime. Hubs, however, is not so accommodating. He is not a fan. So I’m always trying to be more creative than just shoving them in the oven and hoping for the best. This stir-fry type affair was a spur of the moment decision. One of those times when you stick your head in the fridge and do a quick, desperate inventory. I had brussels, I had cabbage. I had a very tasty side dish that takes ten minutes. Heat the oil in a wok or frying pan. 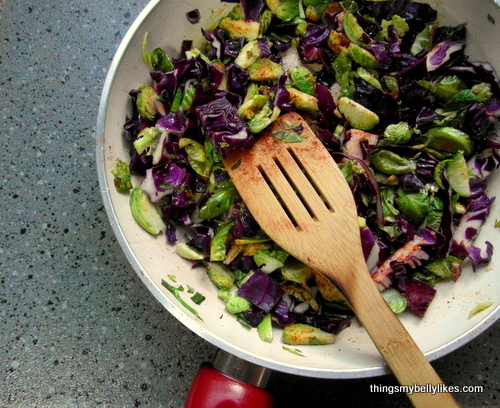 Add the onion, sprouts and cabbage and saute over a medium heat for about 5 minutes. Stir in the paprika and season well. Cook for a further 5 minutes until the cabbage is tender. Just before serving stir through the lemon zest.